Last Monday’s public fleet was the last hurrah for our Wolf doctrine, at least for now. 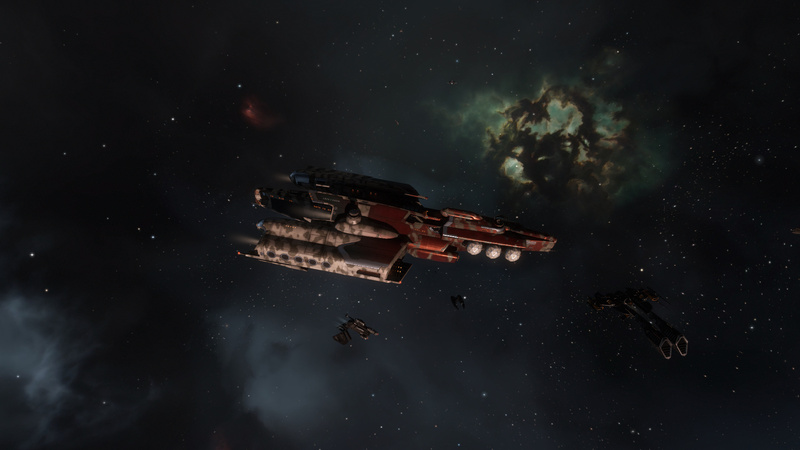 CCP has reworked Assault Frigates and we will do some testing with different boats during the next couple of weeks. Hence Captain Cean was more than willing to take us into a big fight should the opportunity arise. Why let all those Wolves gather dust in our hangars when they could die in a blaze of glory instead. After our Scouts caught a lone Arbitrator and an Algos for our first kills of the evening it looked like our wish would be granted. 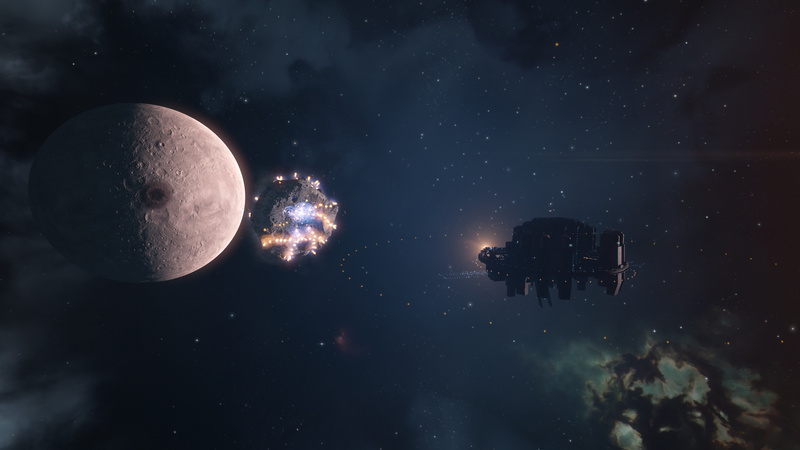 We spotted a mixed gang of Cruisers, Battlecruisers and even an Armageddon supported by two Guardians near Nennamaila. Unfortunately I didn’t save the D-Scan, but I think they were about 20 pilots. We were pretty sure that they’d be willing to fight us. Alas, for some reason they were not. Before we could catch them at the gate through which they arrived in our system they warped off to the NPC station and docked up. What the hell? We weren’t willing to give up just yet though. We positioned ourselves right at the station’s exit and waited for anyone to undock and hopefully break their invulnerability before docking up again. Everyone orbiting Cean and waiting to be booshed off together with our prey. When someone undocks they are invulnerable as long as they don’t do anything (like lock someone, stop their ship or change direction for example). If they don’t stop they keep flying in a straight line though, until they eventually leave docking range. Which means that they have only so much time to decide what to do. Checking if someone’s still invulnerable is as easy as trying to lock them. If you can lock them, they’re fair game. Some of their pilots would poke out their head for a moment to check the situation every now and then, but they were smart enough to dock up again while still invulnerable. That is, until a Cerberus undocked that we hadn’t seen before. He seemingly wasn’t part of that fleet and had no idea that we were there. He obviously didn’t know what to think or expect of our presence, or he just panicked, either way he became lockable. Cean fired his jump field generator right away. Whatever the pilot had done to break his invulnerability couldn’t save him, and he found himself 100km off station surrounded by an angry swarm of frigates and destroyers. 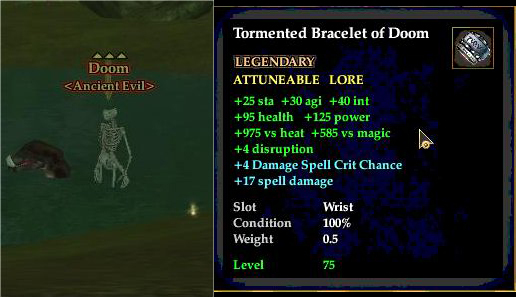 As sadly is often the case the loot fairy said no, but a nice kill anyway. Meanwhile though some pilots of the other fleet seized the opportunity to undock and warp off. In the course of the next 45 minutes we chased them around the neighborhood. We were going to get our fights, whether they wanted or not. First we caught a Myrmidon and his pretty expensive pod, a Caracal was next, then a Gila and an Oracle. During these events we used our jump fields in ways we hadn’t used them before (at least I hadn’t), sometimes to great effect. Whenever we chase someone who manages to warp away just in time we try to see where he went and warp after him. But did he warp to zero? Or to 100km or something in between? Normally we all warp at different ranges so that hopefully at least some of us land within tackling distance. This time around we all warped to 100km a couple of times, and when we saw that our target had warped to zero we used a jump field to jump us right on top within seconds. Pretty effective. The Caracal kill was especially cool. When we arrived at the combat site he was in he had already pulled about 150km range from the beacon and still kept burning out full speed ahead. Cean and I aligned to him and fired our jump fields in relay, as we have done numerous times before. Between aligning and spooling up both jump drives this took about 10 seconds total. Which meant that by the time our second jump was finished he had burned another 40 or so kilometers and more or less bumped right into us when we landed. Even he had to laugh about that. By now we had a good bit of loot in our cargo holds and it was time for a bio break anyway, so we docked up in a freeport Astrahus in Hikkoken. Astrahus sitting above a pretty but rather inhospitable planet. We weren’t satisfied yet though. Next up we caught a VNI, then a Devoter, a Brutix and one of the Guardians (loot fairy still didn’t like us). 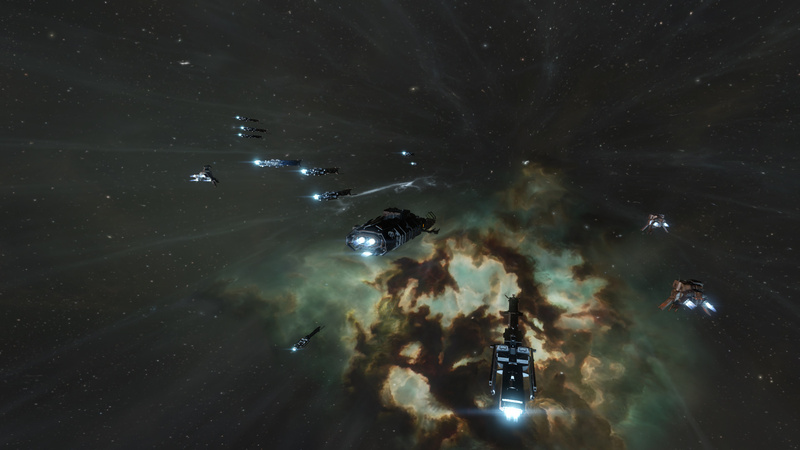 Then an EVE University fleet of Catalysts and Griffins crossed our path. I guess we were in total-carnage-mode by then because we didn’t even think twice about taking prisoners. Three Catalysts, two Griffins and a couple pods fell quickly. Sorry guys! Things quieted down a bit after that, until Spike reported a Daredevil that he might be able to tackle. He was two jumps out from us, but Cean told him to go for it and we gave chase. Our second scout, Waleri, was in between and would arrive ahead of us. Indeed Spike got him and managed to stay out of webbing range at first. His task was to not let the guy escape until we arrived while staying alive himself. A Stiletto is no match for a Daredevil in a one versus one fight. The Daredevil pilot knew his stuff though, and maneuvered himself into web range after a few moments. Bad news. As feared he killed Spike shortly after, but by then Waleri was almost there, and the rest of us close behind. He managed to warp off, but made the mistake to warp to a medium site where we could all follow. Finally Waleri hard tackled him and our fleet caught up. With several logis on the field there was no way he could be a threat to us anymore, so we just held him down. We wanted Spike to reship, return to us and get in on the kill. Suitable vengeance. Daredevil warp scrambled, webbed, target painted…doomed. The guy didn’t want to wait that long and initiated self destruction though. Unsportsmanlike conduct, 15 yards penalty! Ahem. Spike didn’t make it back within two minutes. Fortunately he’s still on the kill mail since the Daredevil didn’t leave system after their encounter, so all is good. Finally the loot fairy decided to be on our side for once too, probably to reward our great camaraderie. 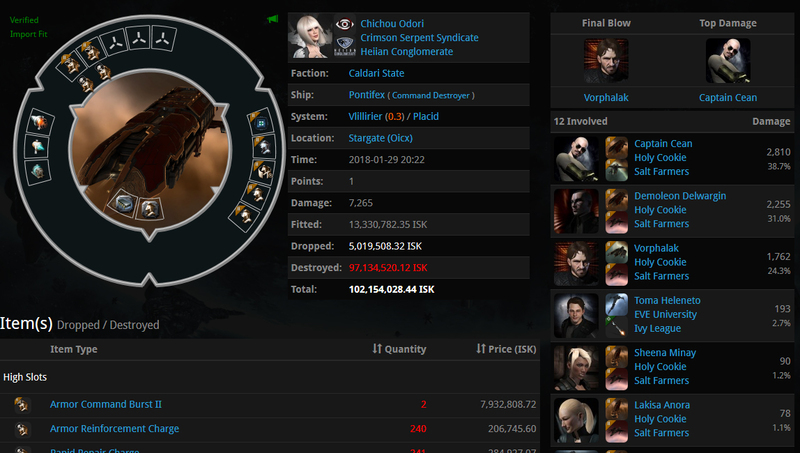 Almost a hundred million ISK dropped, more than twice the cost of our lost Stiletto. The evening still wasn’t over. We killed some more small stuff, and, our last kill of the evening, another Brutix. Spike tackled him sitting right at a gate. He hadn’t seen the rest of our fleet, yet decided not to jump to (assumed) safety after Spike aggressed him. Instead he started shooting back. Of course we all jumped through and killed him. A few minutes later a friend of his convoed one of us. He stated that the Brutix had been quite expensive and he deemed it unfair that a bunch of “unskill people” in “crap rifters” killed him. And that we should “repay his ship”. I’ll leave you with the sound of our reaction to that and a closeup of my Magus and a couple fleet members. Spontaneous cooperation for the win! The formup for Monday’s public fleet looked promising. Not only did we have quite a lot of Wolves, our mainline DPS ship of the day, and enough Deacons for reps, we also had three Command Destroyers, two Hyenas and a Keres for support. I joked that when our fleet looks this good we probably won’t find any targets to kill at all. Indeed our roam started pretty underwhelming. Within the first hour we only caught one lone Stabber. 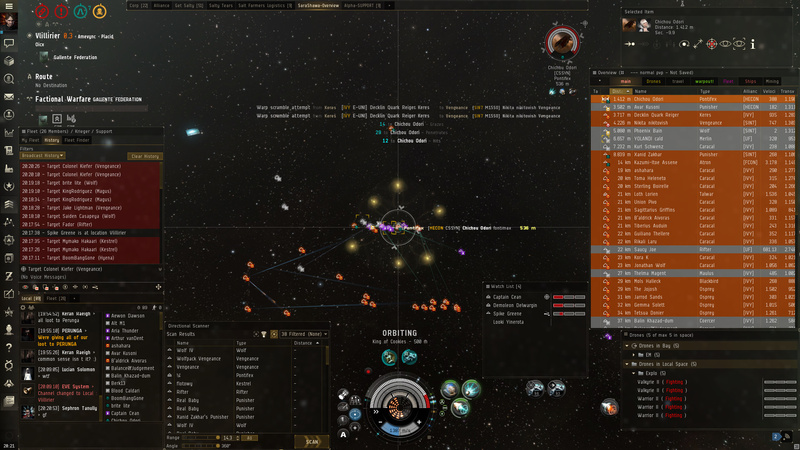 Desperate for a fight our FC, Captain Cean, contacted our friends at EVE University. When I say friends I mean that we like and respect what they do, and when we meet one of their fleets by chance we normally only engage them when we feel that they have at least a fighting chance. 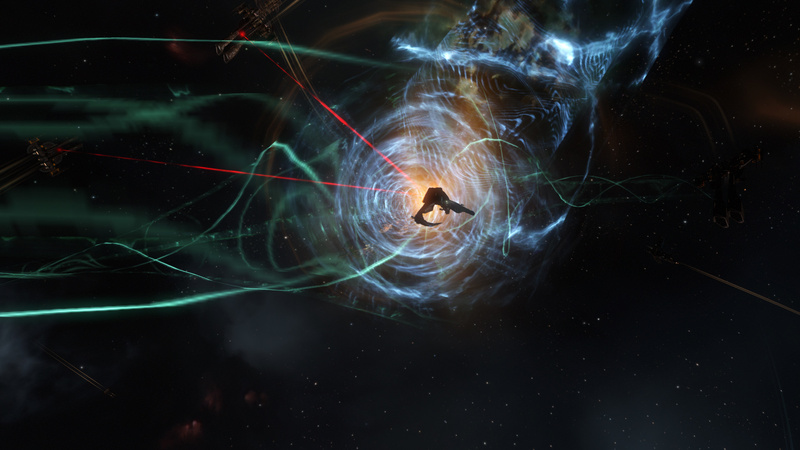 We are pirates, but we are also fully aware that EVE’s biggest problems with player retention are it’s steep learning curve and it’s sometimes pretty hostile environment. 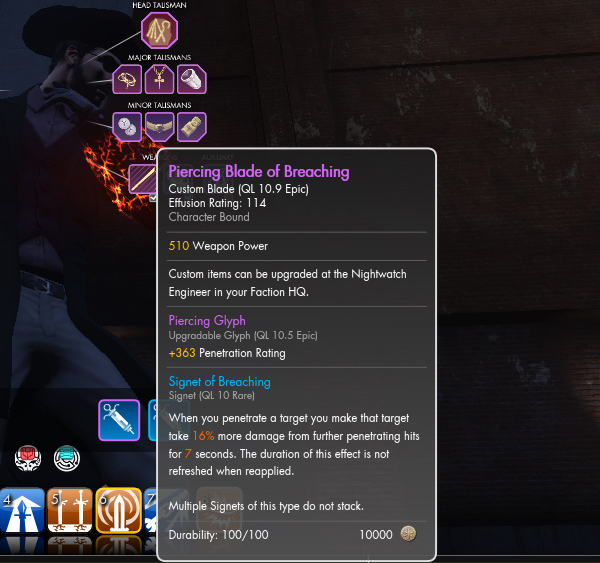 Chasing newbros away from the game by mercilessly slaughtering them time and again doesn’t help anyone. 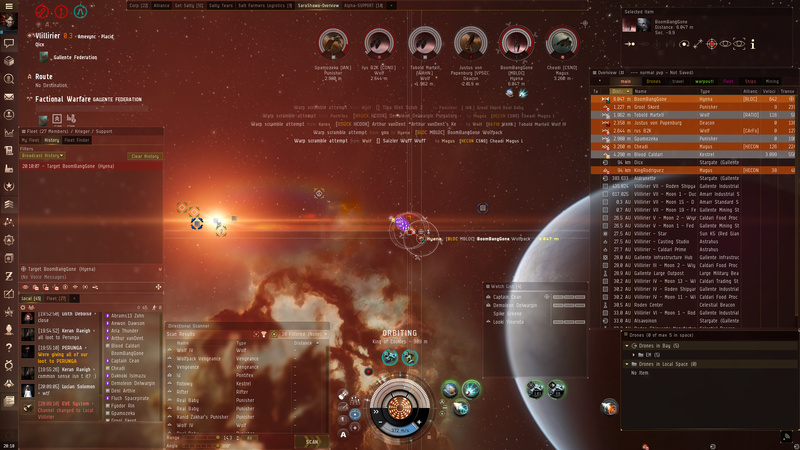 From time to time we arrange scrimmages so that they can have a fleet fight at more or less even odds. It’s good training for them and additional content for us. This time they had a Caracal fleet already going and were willing to meet and fight us. We turned around and headed for the rendezvous system, eagerly anticipating the fight. 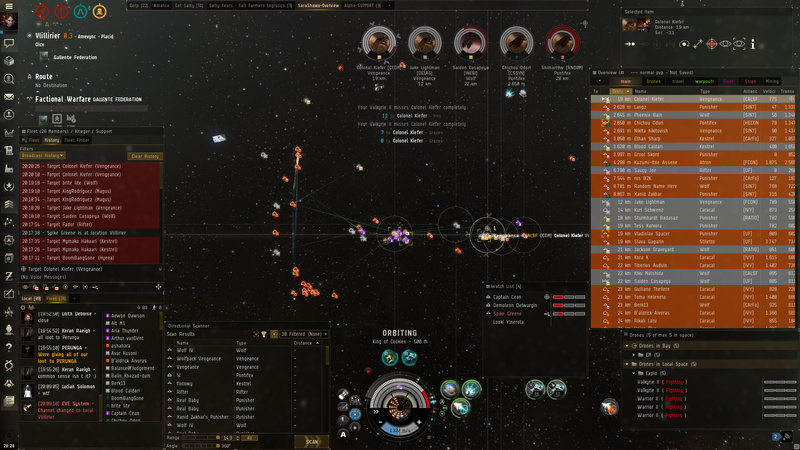 After a couple jumps our scout suddenly reported a neutral gang just one system ahead of us. They had a fleet composition very similar to ours. Since some Caldari Militia pilots were among them we suspected this might be our arch enemy Chichou again. Cean didn’t hesitate for even a second, we gave chase full speed ahead. We caught up with them at the Oicx gate in Vlillirier. Some had jumped already, about ten still sat at the gate. Cean fired his Jump Field Generator as soon as we landed in hopes of booshing at least some of them off the gate with us. We caught eight of them and the fight was on! What looked like some easy kills at first turned into a serious slugfest as the overview filled with more and more hostiles quickly. Their fleet was much bigger than what we had seen, and our position 100km off the gate didn’t slow their reinforcements down much. They probably used their own Command Destroyers to jump right on top of us, I honestly wasn’t able to pay attention to everything that was going on. Chichou was indeed among them. Setting drones on the primary target and keeping Chichou tackled while taking damage myself. Despite our early kills the tide began to turn. They outnumbered us a good bit and still had six of their seven logis left on the field. We switched targets often but had a hard time breaking our primaries, each kill took quite a while. Meanwhile we lost four Wolves, one Hyena and the Keres in the course of less than three minutes. When we also lost one of our Deacons it sure looked like we were going to get wiped out. Suddenly another group of neutrals appeared on grid. More reinforcements for Chichou or a third party looking for easy kills? EVE Uni to the rescue. Never been happier to see these guys. As it turned out Cean had kept Uni’s FC in the loop. And why wouldn’t he? After all they were waiting for us to come and fight them, and were about to get robbed of that opportunity. So they decided to give us a helping hand. Cheers guys! With their help we gained the upper hand again and made short work of the remaining enemy forces. Some managed to get away, but we made very sure their General wouldn’t be able to. We saved him for last. Unfortunately his pod escaped, but it felt really good anyway. Cean and I were especially pleased, because he got top damage and I got the final blow. Lakisa got her whoring-drone on him in time too. As expected we didn’t have to go without a hefty dose of salt from him either. While we looted the field he ranted in local about us having set a trap for him and bringing the perfect counter for his doctrine. Yeah, right. Never mind the fact that we did nothing of the sort, or that he started using ‘his’ Wolf doctrine only after seeing us use it effectively, accusations like that are really grand when they come from someone who never takes a fight if he doesn’t have the clear advantage. Besides, the Battle Report shows that even with EVE Uni’s and our fleets combined we didn’t quite match the numbers he had. Again. Which makes us the clear winners of a relatively even fight. Thank you EVE Uni for being the cool guys you are! Thank you Chichou for…not running away quickly enough this time, I guess. Be sure we’ll hunt you down whenever we get the opportunity. Wrapping things up here’s a screenshot of the fight with the UI turned off and zoomed in a good bit. Unfortunately it’s still hard to make out any details, but at least it looks pretty. Yesterday we met up again to mine some ore. Since last week I got the Mining Director and Industrial Command Ships skills to level 4 each, so the fleet boosts I applied were a bit stronger this time around. The biggest chunks of training are still to come though, since learning a skill from level 4 to 5 takes substantially longer than levels 1 through 4 combined. 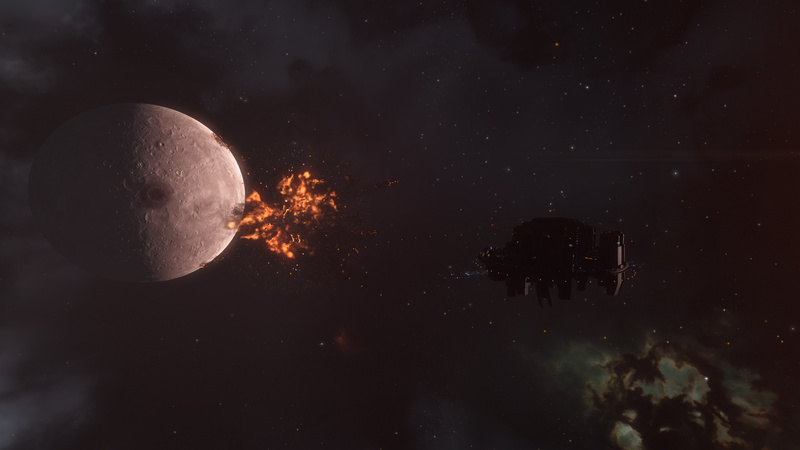 I made sure to be in the right system at the right citadel in time as I wanted to keep my promise to deliver screenshots of a chunk of moon being blown up. 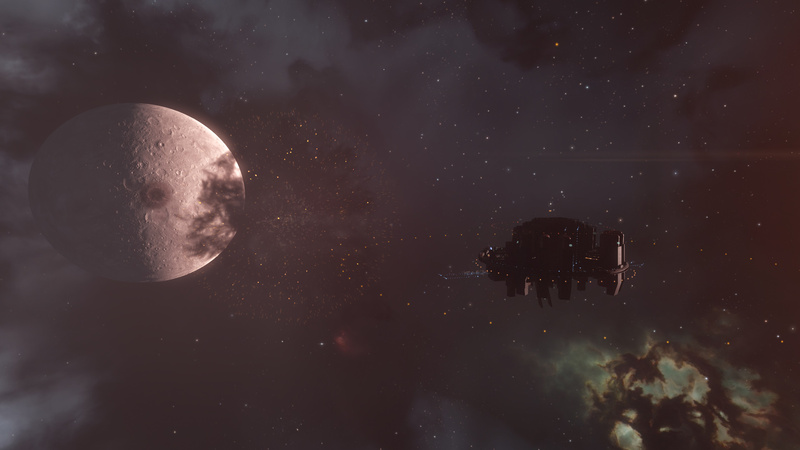 The Athanor charging it’s weapon. Now witness the firepower of this fully armed and operational…errr…refinery. It’s quite a sight. After numerous engine upgrades over the years the game looks pretty great, explosions are no exception. Too bad the game is played with the camera zoomed out very far most of the time. It’s necessary to keep track of everything that’s happening, but it’s a shame nonetheless. We hung in there until the end. I played a bit of Black Desert, read some blogs and prepared this piece on the second monitor while keeping a half eye on the EVE client, changing position when rocks were depleted or watching the scanners when a neutral showed up in local. A low-excitement activity for sure, but also very low-maintenance. In the end I had mined minerals worth about 150 million ISK. Considering that the Porpoise has but a fraction of a Procurer’s or Retriever’s mining capabilities, especially because I can’t use Tech II mining drones yet, that’s not too shabby in my book. Even so I look forward to blow stuff up again during tomorrow’s public fleet. In the end it’s all about the pew pew! 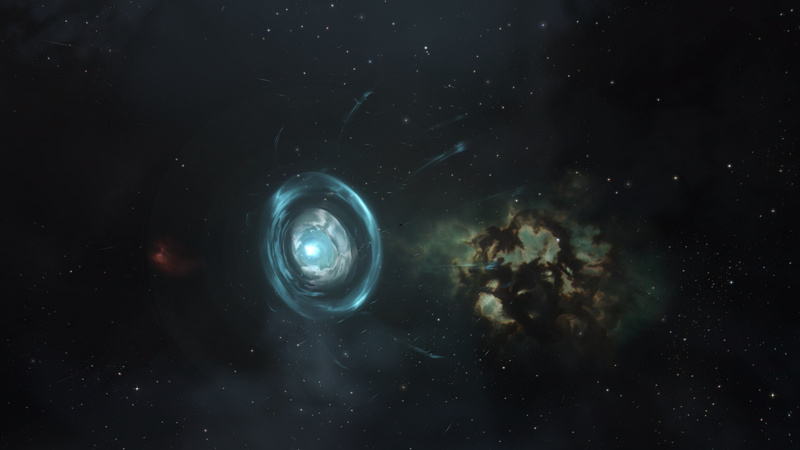 I started playing EVE Online on December 22nd, 2005. Since then I had used a mining laser to extract ore from an asteroid exactly once, and even that was just two years ago when I made a new alt and tried the revised New Player Experience, which included learning how to mine. I had never actually mined for real, is what I’m saying. This changed last Friday. 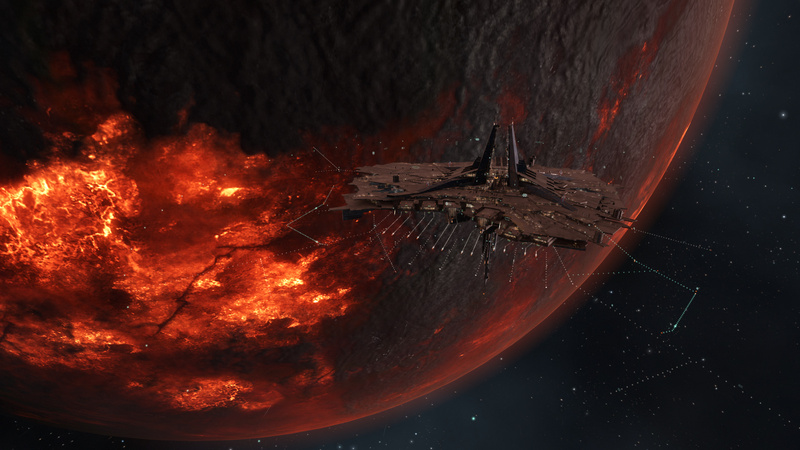 In October 2017 CCP launched the Lifeblood expansion, which included a drastic overhaul of moon mining. 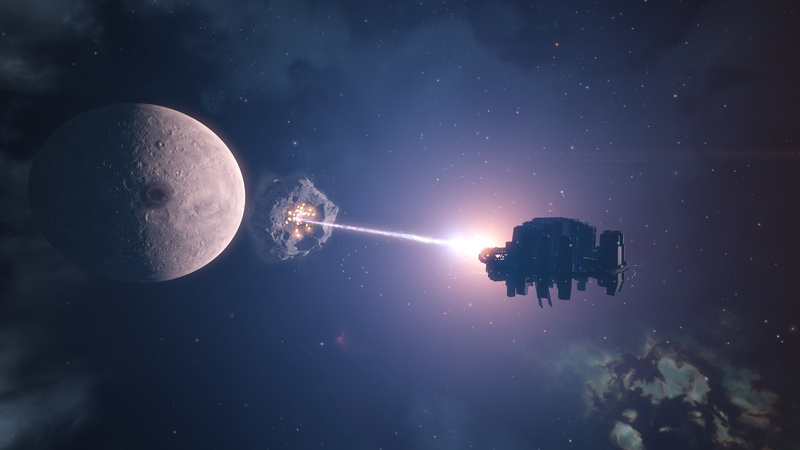 Instead of collecting the ore passively the new player owned structures blow a chunk out of the moon in question and blast that into many smaller pieces, essentially creating an asteroid belt that has to be actively mined by players. 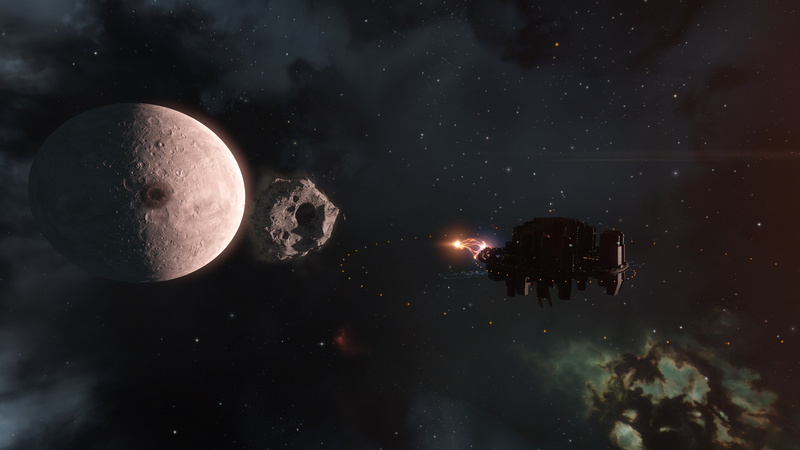 We placed a couple of Athanor refinieries at moons in our region of space, and to reap the benefits we now have to form mining fleets regularly. Some pirates we are, eh? 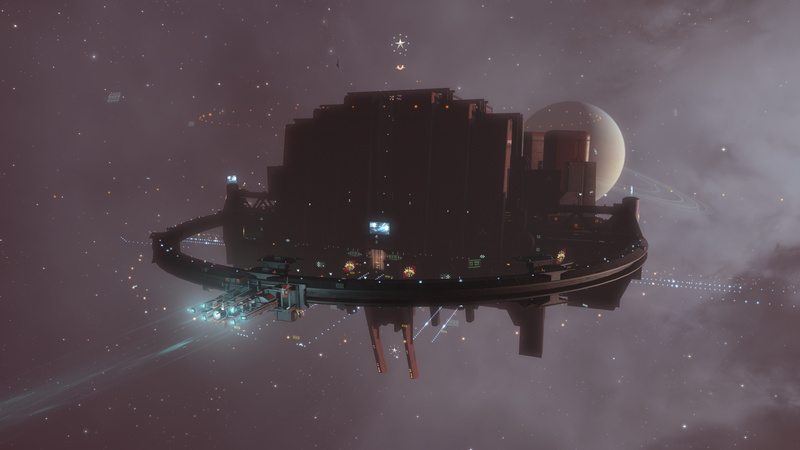 One of our Athanor refineries. The beam on the bottom left is pulling a chunk of ore towards us. A proper mining fleet needs fleet boosts, just as a combat fleet does. The sub-capital ship for that purpose is the Porpoise Industrial Command Ship. Since I already had all non-mining related fleet boost skills maxed out I thought what the hell, I’ll learn those skills too and contribute to our mining efforts. I managed to get the Industrial Command Ship skill as well as the Mining Director skill each to level 3 ahead of Friday, allowing me to fly the ship with reasonable stats and use the Tech II version of the mining command burst modules. We met in tethering range of our Athanor and waited for the citadel’s pilot to push the button and blow the asteroid to pieces. I had the game’s UI turned off and my finger hovering over the print screen button. Alas, there was nothing to be seen, although the chatter on Teamspeak suggested that it should have been. As it turned out I was sitting all alone at the wrong citadel. Doh! I’ll make sure to take screenshots of it next time and post them here. When I finally met up with the fleet the asteroid belt was already waiting for us. More like asteroid sphere or asteroid ball. Asteroid slice maybe? Since we had two Porpoises we split up into two groups with one booster each and warped to seperate clusters of valuable ore. Boosts were applied, and mining lasers and drones began their work. Blue beams for mining lasers, orange beams for drones. My Porpoise right in the middle. Granted, the process isn’t the most exciting or engaging. Asteroids are mined until depleted, then the fleet moves on to the next batch of rocks. 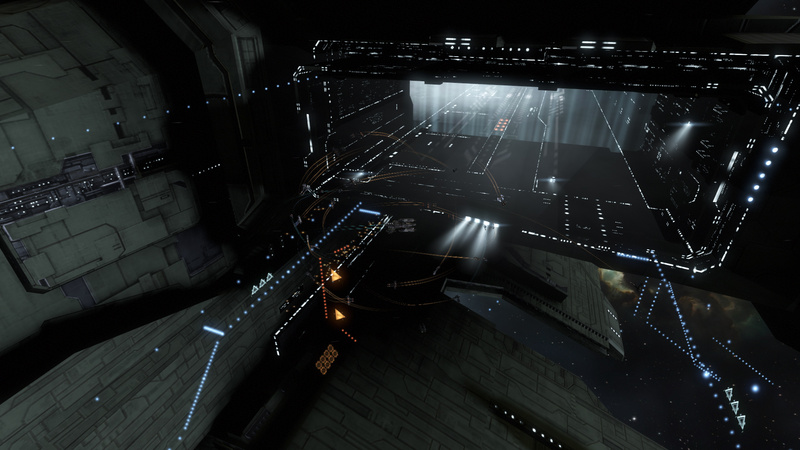 When a ship’s ore hold is full it warps to the citadel, unloads and warps back in. This repeats until we have scooped up all valuable ore. We also have some defenses in place of course, which I won’t disclose here. It isn’t nearly as boring as I would have thought though. The main reason is of course that we do it as a group, chattering about whatever is on our minds and keeping ourselves entertained. As long as at least some people keep watch we can even play something else or watch videos in the meantime. 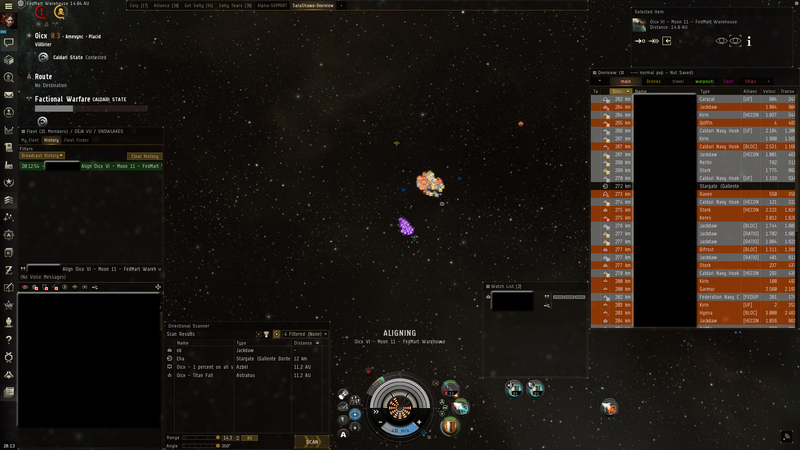 I really didn’t think that the day might come, but, yeah, I’m mining in EVE Online. Well, moon mining to be precise. In my opinion it’s a fun group activity that rewards a nice sum of ISK for your corporation and/or individual pilots. I wouldn’t want to do it every day, but enjoyed in moderation it’s a neat and rewarding variation of the standard routines. 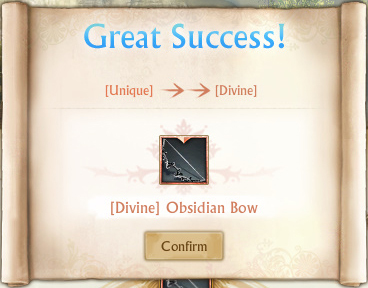 I’ll continue to train the related skills until they’re maxed out, and I’m looking forward to our next op. 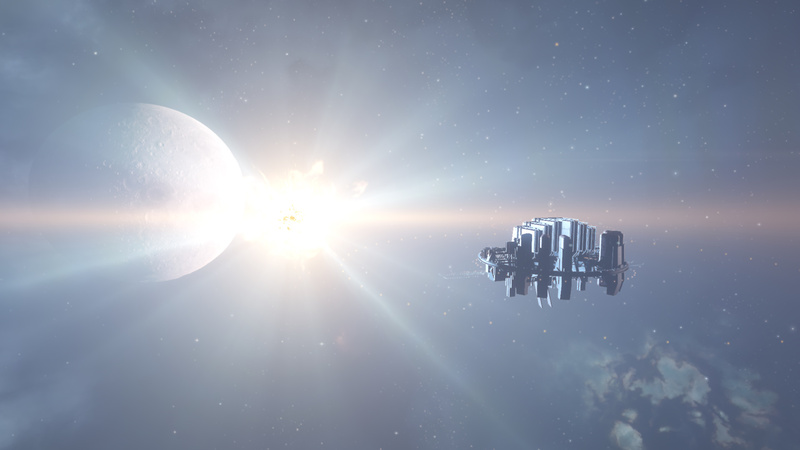 Every Monday and Wednesday at 19:00 EVE time we assemble a fleet that’s open to anyone who wants to give low sec PvP a try. While it’s bad for your security status, it’s really good if you want to score some kills and learn the specifics of low sec. I always try to attend these fleets, because they’re pretty fun most of the time, and I have always liked small- to mid-scale PvP the most. 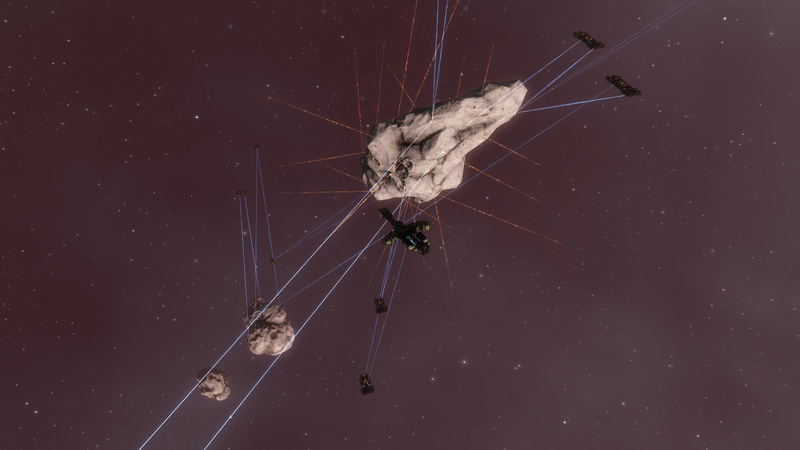 Large fleet fights can be awesome, most of the time they’re anything but. And I’m definitely too much of a chicken for solo PvP. Last Wednesday we used our Jackdaw doctrine, with Kirins and a Hyena for support. We always have a bunch of non-doctrine ships with us though, as we don’t exclude anyone based on what ships he or she can or can’t fly. There were 21 of us in total. I flew my trusty Bifrost Command Destroyer again. Since CCP reworked the Fleet Boost mechanics it’s a really great system, and I love being able to give substantial bonuses to my fleetmates and to myself. Equally useful, if not even more so, is the Micro Jump Field Generator that only Command Destroyers can use. After a spool up time of 5 seconds (with perfect skills, which I have) myself and every ship in a 6 km radius around me are instantly jumped 100 km in the direction my ship is facing at the time. Exempt from this are only ships that are tethered to a citadel, warp scrambled or invulnerable after warping or a session change. We use this mechanic all the time. Sometimes we split up an opposing fleet by jumping all our ships and only a couple of theirs away, making for some easy kills. Or we jump off people sitting at a station or gate, deeming themselves safe since they would just dock/jump as soon as we aggressed them. Not from 100 km off, you’re not! Most of the time we use it to jump ourselves on top of folks sitting at a supposedly safe spot 100 km or more off a gate or the center of a combat site. When we have more than one Command Destroyer we can even stagger multiple jumps and move ourselves 200 or 300 km in less than ten seconds. This time around the jump fields didn’t work out for us as well as we’re used to though. More and more people seem to become aware of these tactics and which ships can execute them, so they are more careful and alert. 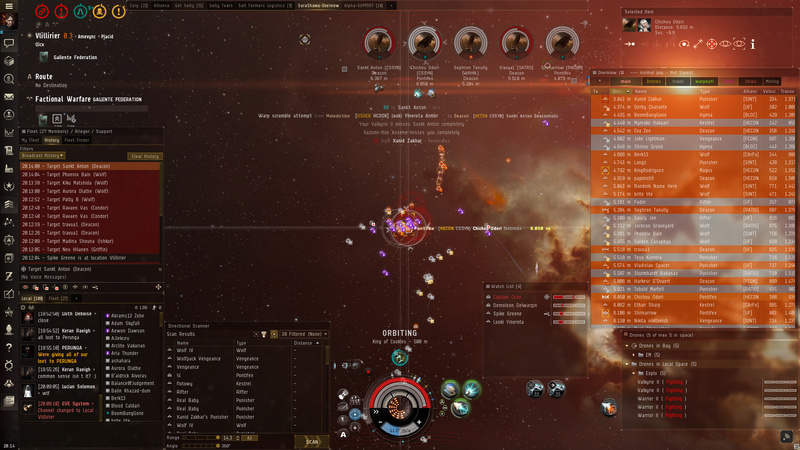 We still got some nice kills, and two little fleet fights in a row toward the end of our roam. We started off with Spike, our scout, spotting a Dominix near our home system Kehjari. We caught up and tackled him, he managed to escape by using his own Micro Jump Drive and quickly warping away after the jump though. We ran into him again in Kinakka, and got him this time. He decided to try and at least take one of us down with him, and he chose that someone to be me. I had barely taken the first points of damage from his drones when Lakisa already threw her reps at me, so I never was in real danger. We then took our usual route through Black Rise and Placid. At first we only caught some small targets of opportunity here and there. 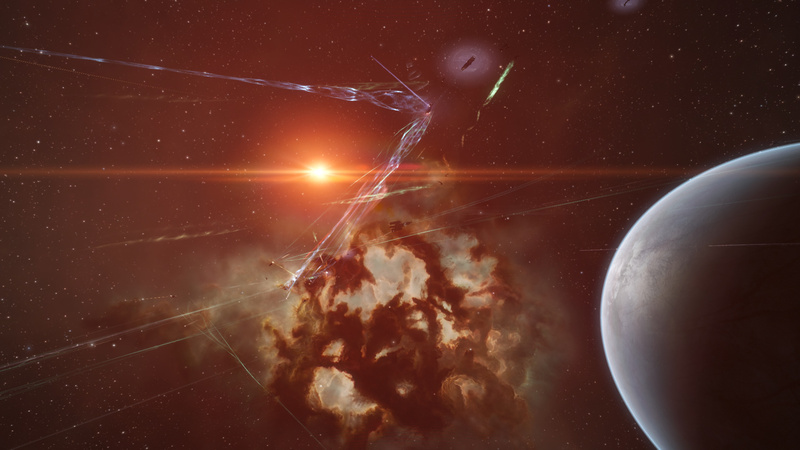 In Oicx we engaged a couple destroyers from Federation Uprising outside of a combat site. 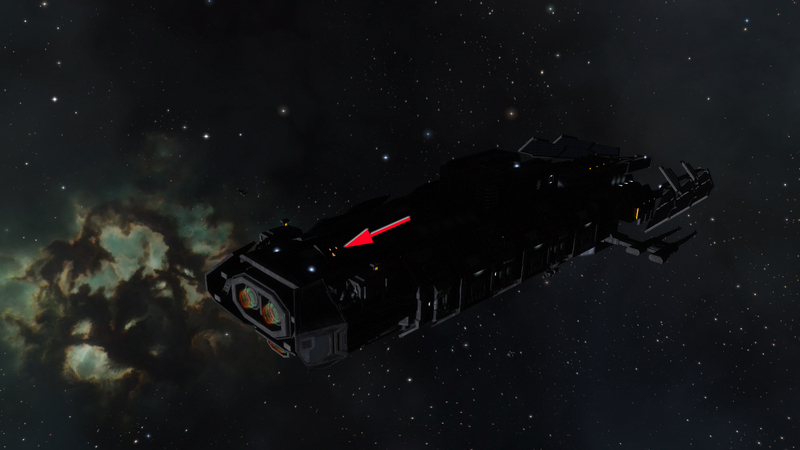 While we were looting the wrecks another one of their pilots warped right into us in his Thorax for some reason. It didn’t end well for him. 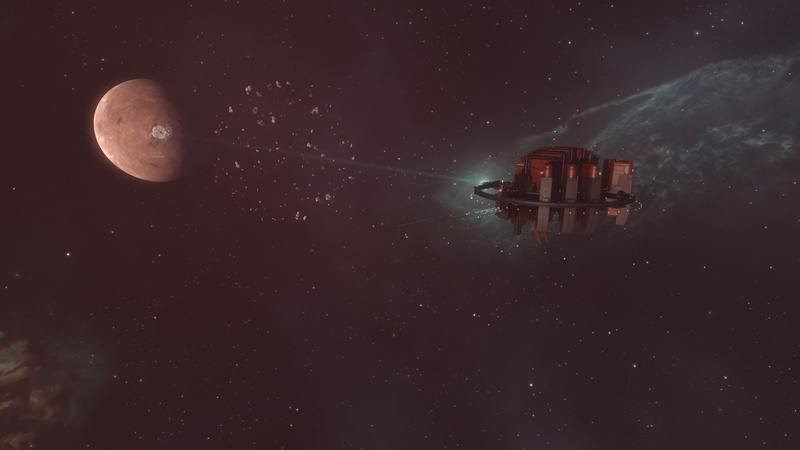 We then crossed paths with our “special friend” Chichou from Caldari Militia leading a fleet of almost forty ships. They also had Jackdaws, Command Destroyers and Kirins, as well as a bunch of Hookbills and other small stuff. Obviously they liked their chances and wanted to engage us, but we kept evading them. One time they sat at zero on a gate while we watched them from a ping about 280 km off that gate. They tried to jump onto us with their Command Destroyers as described above, but we saw that coming and were already fully aligned to the NPC station in system. As soon as they finished their second jump we warped to safety and docked up for a bio break, hoping they’d get bored and continue on their travels. After that we finally got our big(ish) fights of the night. We scanned down a small fleet of Confessors and other small stuff inside a medium combat site in Nennamalia. We warped there and activated the acceleration gate into the site itself right away. We landed right on top of them. Although we had bigger numbers they decided to stay and fight. At least that’s what I assume they did, it didn’t look like they tried to run before we had tackle on them. But who knows, maybe they were just really slow. We downed a Pontifex first, followed by four Confessors, while losing nothing in return. The rest of them bailed. While looting the field a much larger gang appeared on our scans, and by watching local we already knew that it was Chichou’s fleet again. We stayed put and waited for them this time. Sure enough they all landed on grid shortly after, pretty much right on top of us. The shootout began, and it became apparent that we wouldn’t be able to beat them rather quickly. We lost our Hyena and one Jackdaw early on while not killing anything, so Kelvin, our fleet commander, ordered us to retreat by warping off the field to a safespot. Two Kirins were tackled before they could warp though, Lakisa being one of them. It’s always a bad feeling to leave someone behind on the field, but there was nothing we could have done to save them. I was much more fortunate. I not only made it out alive, I had also landed the final blow on one of the Confessors, earning my Bifrost it’s 12th killmark. The report for the battle as a whole in Nennamalia looks like this. It’s the first time I used this tool, so there may be people listed in the red or the green team that weren’t actually part of that respective fleet. Anyway, we’re team blue, and despite our losses we came out ISK positive. Since we were low on logistics now we traveled back to Kehjari for ship replacements. We did one more round turn, killing one R.E.V.O.L.U.T.I.O.N. Vexor in the process (always nice taking out those guys). We also met the CalMil fleet once more. They managed to tackle one of our logis, but he got away by crashing the gate and hid for a while in the neighboring system. After they had left Spike scouted the way for him and we met up again to make our way home together. We called it a day almost two hours after taking off. And so it goes in our part of low sec. Some nights we have many more fights and many more kills (more losses too every now and then, of course), but it was fun nonetheless. If you’re interested in joining one of our fleets (and speak german) you can contact us via ingame chat channel Get Salty.